Let us believers with one voice all praise him who was sent by God in these times of trial for our comfort and guidance, Paisius the wonderful, who struggled graciously and pleasingly for the Master, burning with love for the whole world and pledged his heart for us and for our salvation. And let us call out to him in thanksgiving, saying: Rejoice, Blessed Father Paisius, enlightener of the latter times! Rejoice, for thou didst make thyself a precious follower of the saints of Cappadocia! Rejoice, for thou didst wholly liken thyself to them as a true bearer of God! Rejoice, most fair and fragrant flower, who hast blossomed for our enlightenment! Rejoice, wellspring of heavenly grace, who refreshest the whole world! Rejoice, sweetest food, who fillest the souls that are starved of right teaching! Rejoice, receptacle that hast gathered all our weaknesses, troubles and sorrows! Rejoice, pillar of fire, who art the unshakable support of those that desire to gain salvation! Rejoice, star that shinest in the firmament of the Church, guiding us to the everlasting mansions! Rejoice, for thou wast shown to be a blessing of God and a sign of His ineffable mercy! Rejoice, Blessed Father Paisius, enlightener of the latter times! O Blessed Father, thou wast chosen from thy mother's womb to give thyself up to God in all things and thus become a precious vessel unto Him, for the salvation and guidance of all that put their hope in thee. To Him, Who worked great wonders and mercy through thee, for such a blessing we all sing with joy the song: Alleluia! Rejoice, for thou wast found worthy to be baptized by Saint Arsenius the Cappadocian! Rejoice, for he foresaw all that was to come to pass with thee! Rejoice, for his spirit rejoiced, seeing such blessed fruit sprung forth from the flock that he shepherded! Rejoice, for on account of this he cared for thee unceasingly through all his earthly life! Rejoice, for even after departing to heaven he did not forsake thee, but all the more interceded for thee! Rejoice, for thou too didst honour him as befitting, piously reckoning him to be thy father in Christ! Rejoice, for thou didst struggle heartily for his glorification, gathering testimonies of his wondrous life! Rejoice, for the Saint of God blessed thee to find his most beloved relics, which became a fount of countless healings! Rejoice, for lovingly thou didst lay his revered body in the monastery founded by thee at Souroti! Moving to Greece because of the tyrannical Turkish persecution, thy parents came to the land of Konitsa, and, sacrificing thyself, O father, thou didst begin to ascend the godly ladder of perfection. For even since childhood, thou wast shown to be to be a guiding light for all those around thee, who, seeing thy precious gifts, glorified God, saying: Alleluia! Rejoice, for still young thou didst wholly forsake the fleeting lusts of this world! Rejoice, for through perfect fasting thou didst preserve unspoiled the crown of virginity! Rejoice, for thy youth did not prevent thee from acquiring unceasing prayer in solitude! Rejoice, for instead of revelling in childish games, thou didst delight in ever being with Christ and His saints! Rejoice, for on account of this thou didst avoid the friendship of those that sundered thee from thine ardent love! Rejoice, for thou didst not only strive for outward things, but also adorned thy soul with all virtue! Rejoice, for thou didst follow the kindness and devoutness of thy blessed mother! Rejoice, for she set thee an unspoiled example of love and utter self-sacrifice! Rejoice, for we all wonder at the courage with which thou didst begin to fight the good fight! Called to battle to defend thy country from the unbelievers, O Father, thou didst shine forth in thy boundless courage. For, wholly forsaking the love of self, thou didst ever seek to be amidst peril, in order to spare those that fought together with thee. And seeing this, they all thanked God for such support, saying: Alleluia! Rejoice, for thou wast a wonderful example of utter self-sacrifice in battle! Rejoice, for thou didst utterly scorn this earthly life, thus earning heavenly life! Rejoice, for thou didst not lose thy piety in the dread perils which thou didst endure! Rejoice, for through the greatness of thy soul, thou didst make thyself a light of sanctification to those around thee! Rejoice, for thou didst help in and out of season all in trouble and sorrow! Rejoice, for thou didst utterly overcome human fear, arming thyself with iron courage! Rejoice, for fighting against the enemies of thy country, thou didst also secretly fight against the enemies of Thy soul! Rejoice, for although thou didst wish to die in place of thy friends, God shielded thee as His most beloved one! Rejoice, for through the wonderful power of thy soul, thou didst show us also the path to perfection! With burning zeal thou didst forsake the world, O Father, and wholly dedicate thyself to Christ, joining the army of monks, who unceasingly struggle to overcome their nature. And in a short time thou didst become an angel in the flesh, wholly clothing thyself in Him, to Whom we too humbly sing: Alleluia! Rejoice, angelic man, for thou didst reckon all worldly lusts as vanity! Rejoice, for thou didst strive for three years in the harsh desert of Sinai! Rejoice, for unknown by all, thou didst live there in a hidden cave, enduring heat and frost! Rejoice, for there thou didst fight unto blood against all desires! Rejoice, for through thy great meekness, thou hast utterly defeated the cunning demons! Rejoice, for thou didst wash from thyself all the filth of sin, becoming a true light of Christ! Rejoice, for thou didst begin to pray with fervent tears for the whole world! Rejoice, for seeing thy overwhelming sacrifice, God filled thee with gifts beyond nature! Rejoice, for in thy narrow cave, thou wast vouchsafed countless revelations of divine grace! After fighting the good fight in Sinai, O Father, thou wast called by the Mother of God to her earthly garden, the Holy Mount of Athos, the blossom and light of Orthodoxy. And foreseeing there the place of thy perfection, thou didst thank the Most Holy Queen for her wondrous protecting veil, with which she unceasingly shieldeth the whole world from troubles and sufferings; and with joy thou didst sing to her Son the sweet song: Alleluia! Rejoice, for God foreordained glorification for thee on blessed Mount Athos! Rejoice, for He entrusted thee to the care of His Most Pure Mother, Who guarded thee as Her beloved son! Rejoice, for overshadowed by the Holy Spirit, thou didst wander over the whole Mountain, seeking out fathers of holy life! Rejoice, for thou didst wonder at their unceasing prayers, through which God sheddeth His mercy on the whole world! Rejoice, for thou didst strive to write their lives too, for the glory of God and the profit of men! Rejoice, for afterward thou didst become the disciple of Blessed Father Tikhon, the one perfect in holiness! Rejoice, for thou didst serve him with endless love, in all things trusting in his wise guidance! Rejoice, for seeing thy utter obedience, God also gave thee the gift to abide in thy holy father! Rejoice, for after his repose, Blessed Tikhon revealed to thee that he would pray for thee unceasingly! Perfecting thyself in absolute love, thou didst make thyself a tool of God, Who began to work through thee with great power. For He made thee a comfort for all those that were troubled and a guide for those that were darkened in sin. We all thank God, O Father, for He gave thee to us for our salvation, and we sing to Him thus: Alleluia! Rejoice, thou who hast taught the world through books enlightened by the Holy Spirit! Rejoice, thou who through words of great profit hast dispelled the ignorance of our times! Rejoice, trumpet of the Spirit, who heralded to all the joy of repentance! Rejoice, wondrous prophet, who showed us that we live in the end times! Rejoice, merciful healer of all diseases which cannot be healed! Rejoice, precious carer for all whose souls are burdened with sorrows! Rejoice, godly oil that hast cleansed all our wounds! Rejoice, heavenly peace that hast brought so many broken families back together! Rejoice, skilful guide that hast removed all devilish snares from among the people! Seeing the terrible struggle conducted by the enemy of salvation against the family blessed by God, thou didst gird thyself with the weapon of the word, teaching spouses that only patience, long-suffering, forbearance and self-sacrifice with love can ensure the peace of their homes. Unceasingly we glorify God for sending thee, O Blessed Father, to show us the right way, and we sing: Alleluia! Rejoice, intercessor before God for the harmony of those in married life! Rejoice, for the faithful spouses whom thou didst advise to live in moderation and holiness! Rejoice, for thou didst teach them lovingly and unselfishly to bear one another’s weaknesses! Rejoice, for thou didst show the parents that through prayer the grace of God descendeth on the whole family, bringing peace and happiness! Rejoice, for thou didst struggle against all sins, seeing them as the cause of the falling apart of families! Rejoice, for thou didst make thyself an unyielding reprover of the horrible slaughter of infants! Rejoice, for thou didst tell faithful mothers that through the example of their lives they can turn their children into saints! Rejoice, for thou didst show the young that through obedience they attract the mercy of God and a peaceful life! Rejoice, for thou didst beseech them to earn their parents’ blessing, through which cometh also the blessing of the Holy Spirit! Let us now joyfully praise Paisius, our intercessor, who through his heartfelt prayers miraculously healed all our sufferings, both in body and soul. And let us sing with thanksgiving to God, Who is glorified in the Holy Trinity: Alleluia! Rejoice, strong weapon against the horrible disease of cancer! Rejoice, tireless carer for those that suffer in terrible pain! 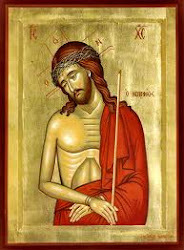 Rejoice, wellspring of healing, in which all those wounded in soul refresh themselves! Rejoice, banisher of demons, for with thy meekness thou didst crush all the wickedness and tyranny of the devil! Rejoice, most merciful father, for thou couldst not bear to see the people crushed under the weight of their sufferings of body and soul! Rejoice, for on account of this thou didst take upon thyself all our troubles and sorrows! Rejoice, for thou didst selflessly pray that God might give thee our weaknesses! Rejoice, for thou didst teach us that all sorrows come through straying from God and His commandments! Rejoice, thou who hast shown us that the reward for those that suffer with patience and glorify God is ineffable! The Lord and Saviour of the world promised a great reward to those that would strive in righteousness for the perfection of others. And though a simple monk and unlearned in worldly things, thou, O Blessed Father, wast gifted with wisdom by the Spirit of the Lord Himself, to guide thousands on the path of salvation. Unto now thou prayest for them to God, to Whom with joy we too sing: Alleluia! Rejoice, for thou didst teach the people to struggle against the evil thoughts sown in their minds by the enemy of our salvation! Rejoice, for shining with the gift of discernment, thou didst at once reveal to thy sons whether their thoughts were from God or from the devil! Rejoice, for by the grace of God thou knewest the depths of the hearts of men! Rejoice, for having great wisdom, thou hast brought to naught all the cunning snares of the evil one! Rejoice, for thou didst bring many to repentance through thine unfeigned love! Rejoice, for thou didst make thyself a wise reproof of the proud and stubborn! Rejoice, for thou wast a tender caress for those in despair and overwhelmed by temptations! Rejoice, for thou didst weep unceasingly for all that looked to thee as a true hope of salvation! Rejoice, for on the day of judgement thou shalt say to God with sweet joy: Behold I and the children that Thou hast given me! Becoming a perfect monk, O Father, and full of the grace of God, thou didst make thyself the steadfast hope of the unconsoled souls of those who desired to dedicate themselves wholly to Christ. And in thy gifts they all saw in thee a guide enlightened by the Holy Spirit. Therefore we praise God, Who did not deprive His flock of shepherds of holy life, saying: Alleluia! Rejoice, for thou didst found the convent of Saint John the Theologian in Souroti! Rejoice, for this became a haven of salvation for souls that thirsted for Christ! Rejoice, for thou didst strive in and out of season to make the nuns into perfect brides of our Lord! Rejoice, for thou didst teach them true monastic life, signifying to forsake the world and its lusts! Rejoice, for thou didst strive unceasingly to kindle their zeal for blessed asectic feats! Rejoice, for thou didst guide them to frequent confession of sins, through which all the devil’s works are utterly despoiled! Rejoice, for thy counsel fell on fruitful earth and refreshed the whole world! Rejoice, for thou didst struggle diligently against the spirit of this world, which doth terrible harm to monastic life! Rejoice, for through thy courage and love thou didst make thyself an example of spiritual victory for all monks! Great was the grace of God on thee, O Blessed Father, and also His great mercy, for on account of thy great self-sacrifice, the Almighty vouchsafed thee wonderful revelations and joys beyond belief. We too rejoice, seeing the reward that God giveth His saints, and we beg Him to make us too partakers thereof and we sing to Him: Alleluia! Rejoice, all-sweet light, through which Christ shineth forth to the whole world! Rejoice, wonderful flame that thou kindlest in us with the love of God! Rejoice, for thou didst make thyself the perfect abode of heavenly grace! Rejoice, for in thee it bore all the fruits of holiness! Rejoice, for God overwhelmed thee with His gifts beyond nature! Rejoice, for thou didst taste of everlasting and uncreated light! Rejoice, for thou didst live with the Saints as with thy close friends! Rejoice, for the Most Gracious Mother of our Lord appeared to thee to strengthen thee in sorrows! Rejoice, ineffable wonder, for thou wast vouchsafed to speak to Christ Our Lord and God Himself! Thou, O Father, didst say with words enlightened by the Holy Spirit that many saints would have desired to live in our times, in order to strive for salvation. For Thou didst herald to us, who live in darkness, that the time is almost ready and that those that now struggle valiantly to win their salvation will receive a martyr’s reward. For this we thank God, Who with mercy looked on His people, sending His Saint for our enlightenment, and thus with voices of joy we gladly sing to our All-Gracious Master the song: Alleluia! This Kontakion is read 3 times. 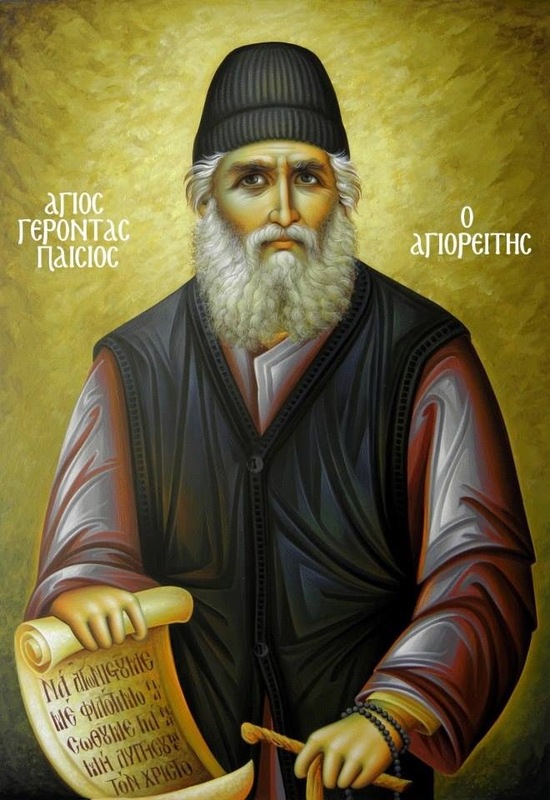 O beloved Father Paisius, thou that didst ascend the rungs of holiness and become perfect in virtue, therefore gaining boldness before our Merciful God, do thou pray to Him, Whom thou didst serve unceasingly all thy life, not to let us perish for the multitude of our sins, but to turn us back to blessed repentance. Thou, who on earth didst heal with such love our countless weaknesses, diseases both of body and soul, canst all the more now deliver us from all sufferings. So do thou have mercy on us, O Father, through thy immeasurable love and godly kindness, not forsaking us that are full of sins. Do thou, who didst never tire of guiding us to salvation and bearing our weaknesses whilst thou wast here with us, now grant us too the wisdom to overcome the temptations which the wicked devil doth ever weave around us and through which he would destroy our souls for eternity. Enlighten us to know the will of God for us and pray to the Master that He might give us power to fulfil it with thanksgiving. Do thou, who didst set an unwavering example of courage and self-sacrifice, strengthen us also to follow Thy virtue, that we may win an everlasting crown, of which thou thyself wast found most worthy. Thus, O Father, do not forsake us, who ceaselessly anger our long-suffering God, but rather stand with boldness before His throne, interceding for us with tears, that God may give us for thy sake most dear salvation. And thus, thanking thee with all our heart for all that thou hast done and still doest for us, let us also thank our Most Gracious God, Who is glorified in the Holy Trinity, the Father, the Son and the Holy Spirit, now and ever and unto the ages of ages. Amen! Αναρτήθηκε από amphilochios στις 10:25 μ.μ.